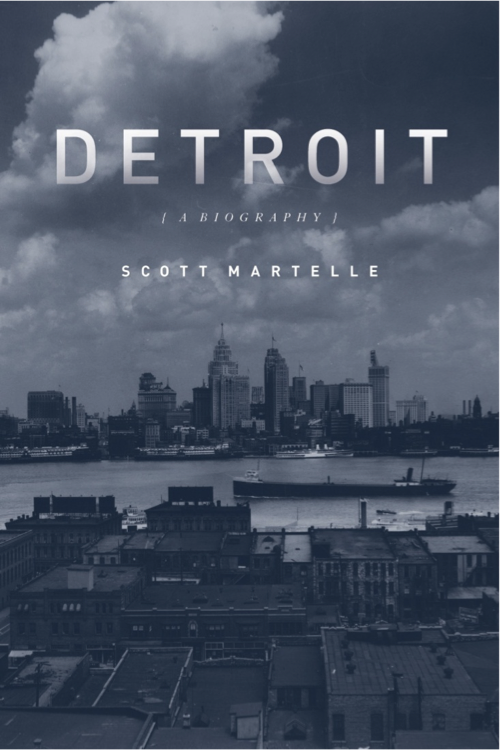 When I first got my review copy of Detroit: A Biography by Scott Martelle, I did the unthinkable: I started by reading the epilogue. I wanted to know right from the start where the author stood on the future of Detroit. Did his research suggest that revitalization is approaching, or even possible? Admittedly, my first reading of the epilogue seemed to be a repudiation of Detroit, that the city’s legacy has condemned it to failure. Such is the defensive posture of a native Detroiter. Reading the book from start to finish is an entirely different experience. Martelle constructs a well-detailed and finely crafted narrative of Detroit’s history, from its founding as a French outpost in 1701 to the present day (although Martelle glosses over much of the last decade or so, likely believing that the city’s die had been sufficiently cast). The book reads a lot like Detroit’s history — slow yet building over the city’s first two centuries; fast-paced and chaotic after the introduction and rapid growth of the auto industry; slower-paced, exasperated yet reflective as decline sets in. The historical narrative is interspersed with chapter interviews of native Detroiters who offer their insight on the past, present and future of the city. Martelle brings liveliness to the narrative, and his meticulous research is evident. It truly is a biography. Detroit’s early history was really no different from its Great Lakes peers of Buffalo, Cleveland and Milwaukee, which all had varying degrees of French settlement, British rule and American growth. There is a lot of discussion about the French role in the creation of development patterns in Detroit — the ribbon farms — that led to a highly privatized riverfront. Once the French were gone and the British took over, there is similarly a lot of discussion about the contemptuous and oftentimes violent ways the British military elected to engage southeast Michigan’s Native Americans. The French and British did more to shape Detroit’s character than most realize. Detroit, like the others, transitioned from regional trading center specializing in iron ore and lumber, to becoming a craftsman’s heaven building horse carriages, stoves and other metalworks. Interestingly, the author notes that late 19th and early 20th century Detroit was known as a top cigar-producing center. Who knew? But the number of skilled workers in the carriage-building and metalworks industries set the stage for the development of the “horseless carriage” industry in Detroit. Of course, the singular power behind the founding and growth of the auto industry in Detroit is Henry Ford. Martelle is quick to make the well-known point that Ford did not invent the automobile; there were a number of “tinkerers” around the world, even others in Michigan. But he was in a position to take advantage of the local capital and skilled workforce to get the Ford Motor Company off the ground. Martelle also alludes to the fact that as Ford the company grew, Ford the man’s flaws took root as pathologies to Detroit’s character. Ford’s aggressive business policies were well known and emulated; his racist, anti-Semitic and anti-Catholic leanings are acknowledged; his staunch anti-union sentiments led to bloody battles between the company and workers; his unwillingness to leave lasting institutions in Detroit, like an Andrew Carnegie in Pittsburgh, set the template for other Detroit industrialists. The author paints a picture of Detroit breezing through the first third of the 20th century as the Silicon Valley of its time. Most people likely believed that economic growth alone would solve whatever underlying problems may exist, and there were many. Tensions grew as southern and eastern European immigrants competed for assembly line jobs with longer-established Scotch-Irish and German immigrants. Tensions further grew as African-American migrants moved up from the South for jobs, particularly during and after World War I. Job competition intensified as the Great Depression emerged, and the rigid but informal segregation patterns in the city led to housing competition as well. The boiling tensions made Depression-era Detroit one of the most brutal places to be in America. The tremendous population growth of the previous decades was not supported by similar housing growth in Detroit, which made the city’s Depression housing shortage one of the most acute in the nation. The collapse of the auto industry at the same time made Detroit’s unemployment the worst in the nation. And the union battles of the time made the labor situation one of the most contentious in the nation. This was Detroit’s second critical moment, after the explosive growth of the auto industry. City leaders and industrialists elected to let the economy sort out the city’s growing pains when things went well, and they again elected to let the economy do its thing as the city faced its first existential crisis. They were right — in the short term. Detroit emerged as the “Arsenal of Democracy” that built the armory that saved America and Europe. However, the lack of action by city leaders and industrialists had long term impacts that became evident after World War II. – What if there had been better early cooperation between the auto industry and unions? – What if the industrialists like Ford had established enduring local institutions? – What if the housing and overcrowding issues had been dealt with differently? – What if Detroiters had had local representation (i.e., wards or districts) that could have represented the wishes of diverse residents and forestalled or diffused tensions? – What if Detroit had become a defense contracting center that could’ve led post- World War II growth? Unfortunately, Detroit’s leaders did not appear to be asking themselves these questions at the time. Martelle then argues that Detroit’s path after 1950 is one of social and economic decline. Detroit becomes the epicenter of a Supreme Court legal battle on housing racial covenants; efforts by white residents to violently intimidate blacks from moving into all-white neighborhoods become commonplace. White flight has its start in Detroit well before it does in other major cities. The Auto Big Three (Ford, General Motors and Chrysler) decide to control more of the manufacturing process themselves and put the squeeze on auto parts suppliers. They begin to shift manufacturing jobs first to the suburbs, then to the South, then out of the country. Finally, the riot of 1967 begins to solidify the image of Detroit as being out of control. The author is clear about the challenges that face Detroit today. Racial animosity and mistrust, usually couched in city vs. suburbs terms, is at a level virtually unmatched in the nation. Coleman Young, Detroit’s first black mayor, is often viewed as the wedge that widened the divide between white and black in Detroit. However, Martelle portrays him as someone who wanted Detroiters to directly confront its racial legacy, but was still nurturing the resentments of his segregated upbringing. Meanwhile, he paints many whites as believing that past indignities experienced by blacks are indeed past, and are resentful of the management of the city after they left it. But who can manage a city when jobs and middle class residents flee? I read the epilogue again after reading the rest of the book. The second time around it read like a lament, a cry of sorrow and anguish for the city that gave us not only the automobile, but the idea of a stable middle class. Martelle clearly demonstrates that Detroit was uniquely impacted by national and global trends and policies, and that any city established in the same fashion would have suffered the same fate. Sadly, however, he says that the nation has left Detroit behind, and wonders if the nation will ever repay the debt it owes to the Motor City. I think this is the only solid point the writer makes. Ford invested in Dearborn from the very beginning, so you can’t really blame Detroit’s issues on them. Employers tend to follow residents, so you have to put the blame for Detroit’s decline on the people that initiated the outmigration. The middle class chose to leave the city because they did not want to deal with the social issues occuring in the City in the 60’s and 70’s. If the City had an alderman system like Chicago, maybe it would’ve slowed or stopped outmigration from certain neighborhoods, but Chicago still has the south side, so I’m not sure if it would’ve kept the entire City from decline anyways. The parallel to Silicon Valley just feels wrong. Yes, Silicon Valley had it’s roots in large defence contractors, but it also developed a culture of constant dynamism and innovation. It also saw rapid growth and booms and busts but not the kind of explosive growth Detroit did. Detroit developed very much in the “progressive era and New Deal era, when dynamism itself was not seen as a good thing. The author seems to touch on that. I mean the author of this post. I haven’t read the book. I think this statement needs to be questioned. IMHO, Detroit was the product of an era of arrogance, power and misguided central planning of a kind we would best leave behind. Mostly what it left us was a series of promises about stability, jobs for life, that were never based in reality. At the barber’s thumbing through GQ. I saw a short piece making a connection between Berlin in the 1990’s and today’s Detroit. I think that is the closest link with all the contradictions and anger. A few hold on to the false promise of the old order. Government offers some quick fixes or a new shiny builings like Helmut Kohl did. The real excitement and energy comes from the people who see the failure and are excited by the possibility of playing around and doing something new. Thanks everyone for their comments. Every time I try to move away from Detroit stuff, something pulls me back. Please feel free to take a look a my most recent post on the Corner Side Yard, “What Really Makes Detroit Different”.